The stone exterior featuring two balconies and a circular fountain in the driveway. The home was inspired by traditional English manor houses. The four-bay stone garage with wooden doors and three dormers. The rear exterior, displaying the balcony and overpass. The circular stair with wooden handrails and newels and wrought iron balusters under a chandelier. The kitchen with flush inset oyster cabinetry, heavily paneled charcoal glaze, and a graceful arc. Also featured are glass front cabinets a table that is anchored to the island, a wood-paneled hood supported by corbels, and a built-in refrigerator and pantry. There are hanging light fixtures as well as a domed light feature. Kitchen by Berkshire Homes. The dining room with white columns and molding, a chandelier over the table, and recessed wooden cabinetry. 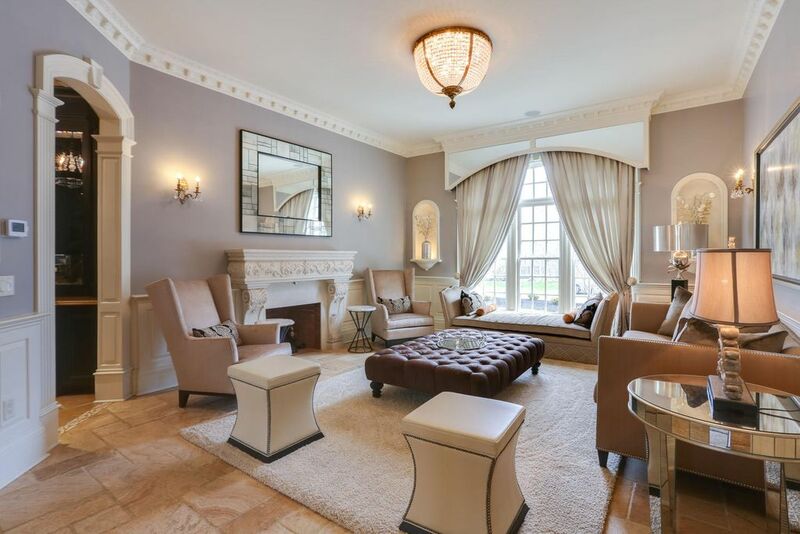 The front room with white molding and an arched entrance frame. 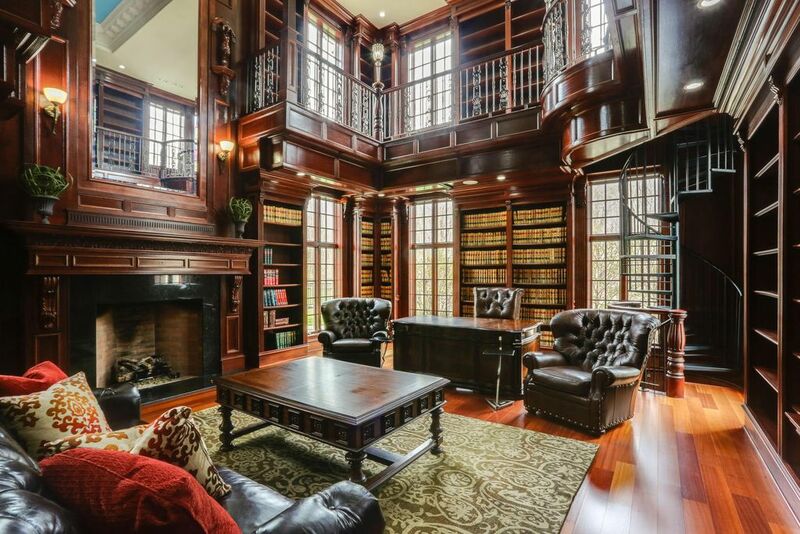 The library, featuring a fireplace, high ceilings, a spiral staircase, and wooden shelving and molding. The library was inspired by world's largest home in NC, as seen in the balconies and glazing. The billiard room with dark, wood paneling and molding and a hanging fixture. The warm paneled interior bridge from the garage to the house with a hanging light fixture and wooden crossbeams. The master bedroom which opens up to the master bath and features white wood molding, white columns, and a tray ceiling. The master bath with white columns and molding, and a freestanding tub. 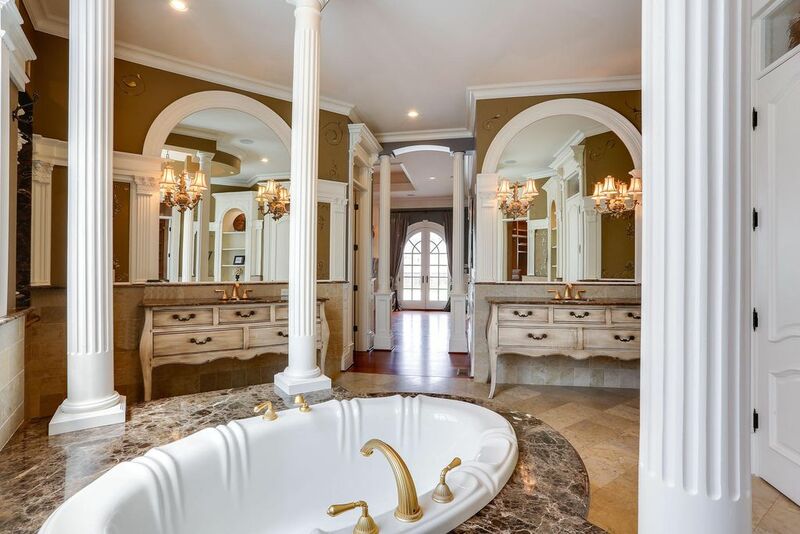 Console style vanities appear as elegant furniture, and arches repeat in mirrors. Overtop sconces are mounted on mirrors. The finished basement with stone and wood pillars and a hardwood floor bar area. The In the Manor Tradition home is inspired by traditional English manor houses and features a blend of natural stone work, arches, curved elements, iron work, and an asphalt shingled roof that looks like slate. 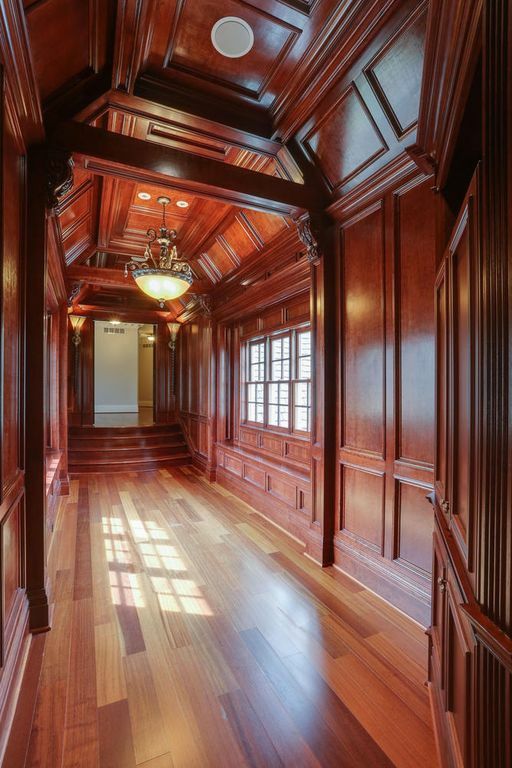 The interior is full of rich details such as paneling, cabinetry, mill work, and spiraling stairs. The floor plan features a garage that is connected by a bridge that can be driven under, and tucked behind the façade is an amply sized garage.